H.E. Dr. Pornchai Mongkhonvanit, President from Siam University (SU) attended the first newly elected administrative board meeting of the International Association of Universities (IAU) at UNESCO building. SU President also serving as IAU Vice President and Chair of Higher education for sustainable development working group. 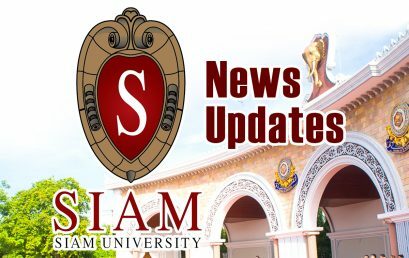 Siam University signed MOU with Dhipya Insurance Plc. Dr. Jomphong Mongkhonvanit from Siam University attended meeting with the education minister of Thailand on 3rd March 2017. The key agenda is to enhance educational standard and development of Thai Society. [divider] On 1 February 2017, Siam University signed MOU with Radjadamnern Commercial College (RCC), one of the first Private Commercial Schools in Thailand, aimed at creating promising future together. Delegation from RCC also visited Siam University library and information center to see SU’s digital innovative integrations. SU Students participated on Annual Athletic Event 2017 along with many universities in Thailand. This year SU students achieved many prizes and inspired youths to involve in physical activities. President Dr. Pornchai Mongkhonvanit and Department of Sports usually pledges student engagement each year nationally and internationally.